The Berliner Sparkasse - founded in 1818 by the Magistrate of the City of Berlin - is one of the oldest communal savings banks in Germany. With almost two million customers, about 120 branch offices and more than 1.3 million private checking accounts, the savings bank is the market leader in Berlin. As part of the Sparkassen-Finanz Group, it is a modern financial services provider with a wide range of offerings for private and commercial customers. 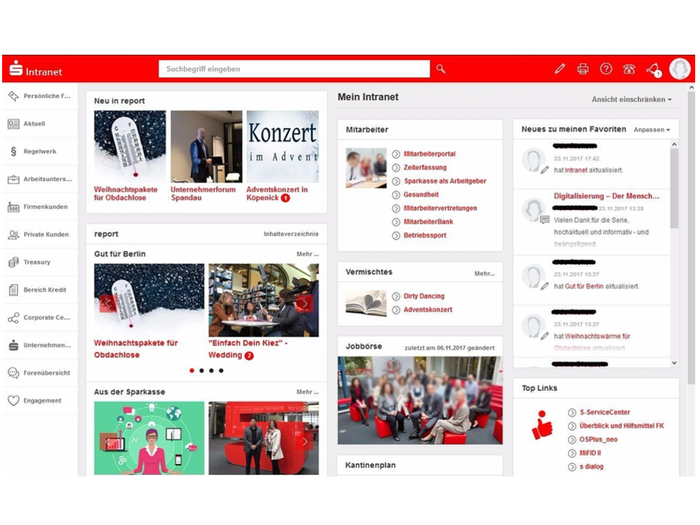 Infopark developed a complex intranet application for the Berliner Sparkasse on the basis of the CMS Fiona 7 content management system. The intranet, as part of their digital workspace, should simplify the daily work of more than 3,500 employees and make it possible to more quickly access important information. Every user can design their own intranet starting page with the most important information for them. Important messages are displayed as individual notifications. The consulting team from Infopark developed and implemented the concept in close cooperation with a team from the Berliner Sparkasse. Since the launch the Infopark experts have assisted the Berliner Sparkasse to further develop the intranet with numerous additional functions. Thanks to the smooth inline-editing within the CMS application, the Berliner Sparkasse can now offer constantly updated content in their intranet. The editors can obtain or grant approvals for the publication of pages thanks to the integrated workflows and have a simple overview for the current status of the workflow. The system makes daily backups in an audit-secure archive so that the archived versions can be restored if necessary.